Somewhere in the red clay hills near the Tippah River at Potts Camp lives a man who plays the blues. 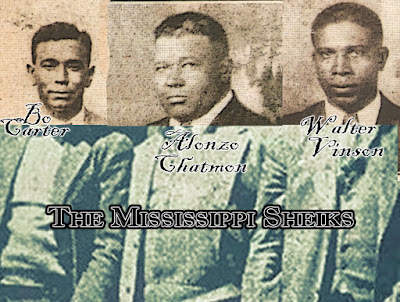 Kenny Brown, formerly of Nesbit, and living in Memphis until year 2000, moved to his 30-acre estate to get back to the peace and quiet of the country - the roots of the Mississippi blues whether it be in the hills or the delta. 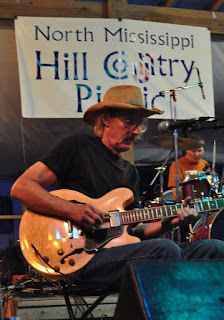 Brown is a fourth or fifth generation blues guitarist who has been influenced and taught by some of Mississippi’s second generation bluesmen living in the red clay hills area of Mississippi stretching from the state line in the north down through the center of the state to Jackson or more. Now 52, Brown was just a boy when his interest in guitar sparked when he began taking lessons and trying to read music. Fortuitously, by age 12 he was situated right across the road in Nesbit, from an aging blues great, Joe Callicutt. Brown was soon introduced to Fred McDowell, another second generation blues musician by another blues enthusiast, Bobby Ray Watson of Pleasant Hill, Miss., at one of the Memphis Blues Festivals around 1969. 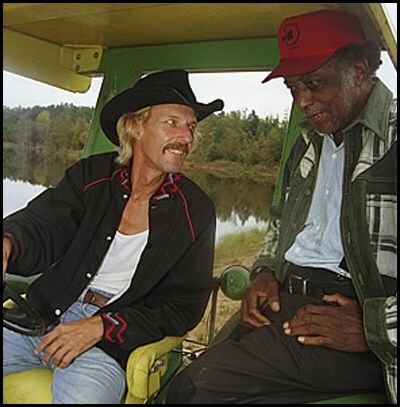 “Right after Joe died, Bobby Ray introduced me to Johnny Woods, a famed harmonica player and vocalist from Marshall County. Aspiring young musicians have a way of meeting and being influenced or taught by those around them. Brown met R.L. Burnside, a bluesman. He worked and travelled on and off for the next 30 years in Hernando with Junior Kimbrough. “I met Burnside when he was opening for a rock band at a little concert in Hernando that a friend of mine was putting on,” he said. “Johnny Woods first took me down to Junior Kimbrough’s house when he lived out on Marianna Road just outside Holly Springs. It is the way musicians pass on what they have learned either directly or through records and tapes to the next generation that provides continuity to music, guaranteeing it will live on, though it may and does evolve from generation to generation. Or, as in the case of rock and roll, one genre can be the springboard for another. As with any serious artist, sooner or later they mature, write some of their own music, and cut some records. And they begin to influence the next generation - assuring what is learned and appreciated is passed on. That’s where Brown is today, out on his own, spreading his wings, and teaching aspirants. He will be giving formal instruction to his godson, Jocco Rushing, a 17-year-old, with the assistance of a grant from the Mississippi Arts Commission. Brown has taught several other apprentices - a student from Oxford and from Hickory Flat - with assistance from the Delta Blues Educational Foundation. Brown can’t put his finger on just what it is that sparks interest and fans the flames until a youngster gets enough of a start to continue development. Brown explained how he was drawn to Potts Camp. Jocco moved in with Brown for a couple of years. Like when Brown was young, music could be heard coming from somewhere in the red clay hills. Jocco has moved to the Mississippi Gulf Coast to be with family and there is not as much music being made on the porch near the Tippah River on Brown’s 30 acres now. He continues to enjoy riding horses and keeping chickens and some dogs. He will work with Jocco again, formally. “He is teaching me, too,” Brown said. He and the Burnsides are all now out on their own, he said. Brown said he still visits Burnside at his Wall Hill Road home off Highway 309, when he can. He is now rated as a Master Artist, by the Mississippi Blues Commission. He will continue on his own or with other artists as a part of the evolving blues of the red clay hills of Mississippi and the Delta Blues. “We still carry it on - the Burnside and Kimbrough kids,” he said. Coming up for Brown is a chance to write or play for some movies. He has been talking with producer Robert Muggie about a “Native Sons” series being filmed at Ground Zero, the food and music hall in Clarksdale, Miss., owned by actor Morgan Freeman and Clarksdale attorney Bill Luckett. 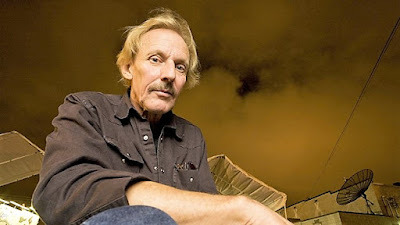 As with all blues vocalists and musicians, the attraction to the blues is because it comes from the heart, Brown said. For more about Kenny Brown visit www.kennybrown.net. or www.fatpossum.com.